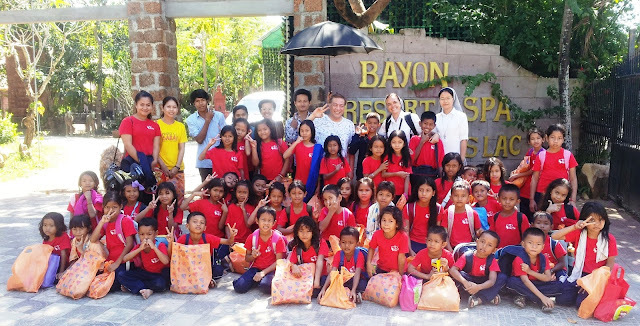 On the 28th and 29th of December my friends, teachers, Sisters and I went for an outing at Bayon Resort that is located near Kean Svay, Kandal province in Cambodia. We were 45 children from grade 1 and 2 and five leaders from grade 5 and 6 from Don Bosco School, Chreh. Next day on 29th, we had European breakfast. After breakfast they presented the gifts to the winners of the games. They also gave all of us some gifts – notebooks and school materials. Then, we offered them some simple gifts and one of us expressed our deep gratitude to Mr Renz, who was moved to tears to see us so happy... and all of them and we all sang a song: "Give Thanks with the Grateful Hearts”. After this we went to swim again with much joy. When we finished swimming we took pictures together with them and came back to school full all joy and gratitude for the unforgettable experience. At the end he asked Sister Dory to come again next Christmas with 100 children. We were very happy to meet people who are so generous, friendly and loving to us, and make us comfortable with their warm acceptance. We were impressed how people who have much are able to share what they have with the less fortunate and poor.